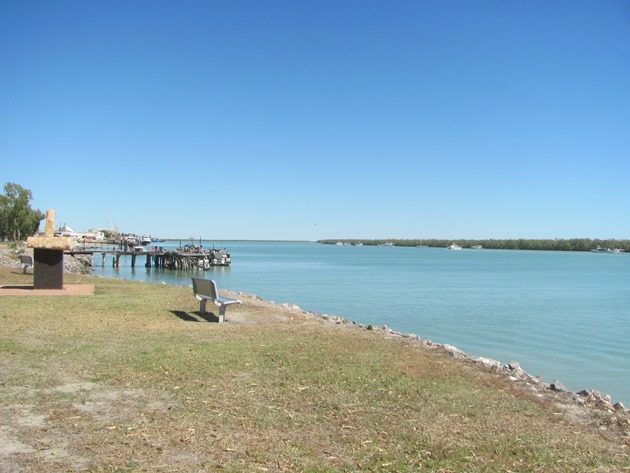 Karumba is a small town on the Gulf of Carpentaria in Queensland with a population of about 500 people, but during the cooler months it is a popular fishing destination and can become very busy. There is access to the Norman River and the Gulf of Carpentaria and there are of course crocodiles to consider in this northern part of Australia. Our visit to Karumba earlier this year was of course to observe the local bird-life and we took some time driving from Normanton. 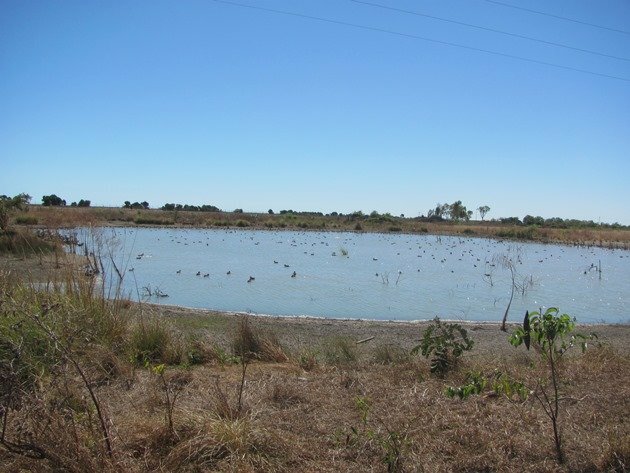 The first place to stop on the way to Karumba from Normanton is the Mutton Hole wetlands, where among the water lilies there were good numbers of water-birds. 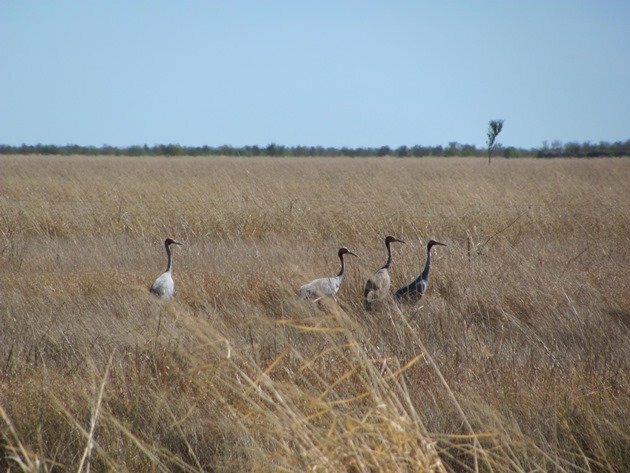 Beyond the Mutton Hole wetlands we soon stopped to observe a Sarus Crane family feeding near Corduroy Creek and then we encountered more and more Brolga and Sarus Cranes all the way to Karumba. 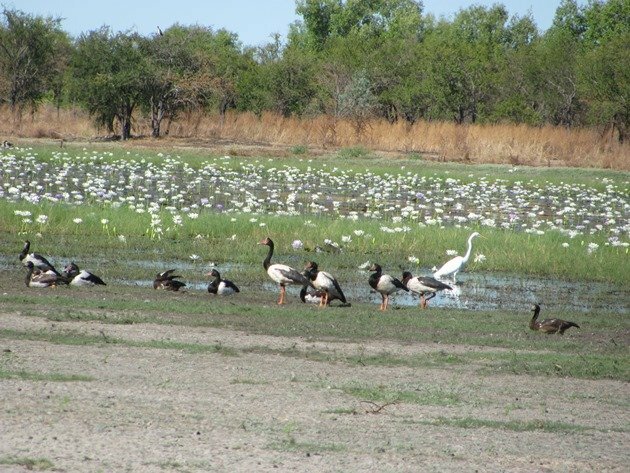 The flocks of these large birds were mostly close to the highway in the dry grass feeding and the Sarus Cranes were fewer than Brolga and often mixed among them, so you had to check each flock for both species. The Brolga does not have the red feathers down is neck, but does have a dewlap to distinguish it from the Sarus Crane. The differing leg colour was not a useful feature to look for in the long grass! A small wetland left behind from the past Wet Season before we reached the turn-off to the two halves of Karumba offered Pink-eared Ducks, Zebra Finch, Black-winged Stilt, White-necked Herons, Straw-necked Ibis, and Australian Pratincoles. The journey of approximately 70 kilometres/43 miles from Normanton took us some time and it was all thanks to the great birding along the way! It is a good bitumen road, so you can do the journey fast if you choose to! 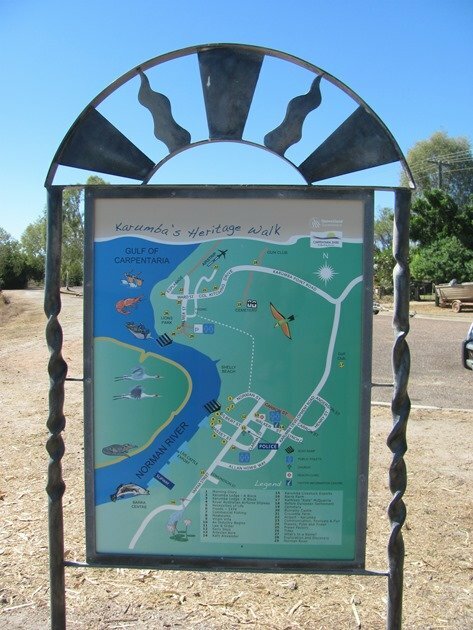 Karumba is a town in two halves and there is one half by the Norman River and the other half by the Gulf of Carpentaria and our first destination was the coast. Just before we got to the coast in town we were surprised to see a wetland on the right hand side and soon pulled over to observe all of the birds there. Royal Spoonbill, two Yellow-billed Spoonbills, Black-fronted Dotterels, White Ibis, Masked Lapwings, Pacific Black Ducks and Grey Teal were among some of the bird species present. 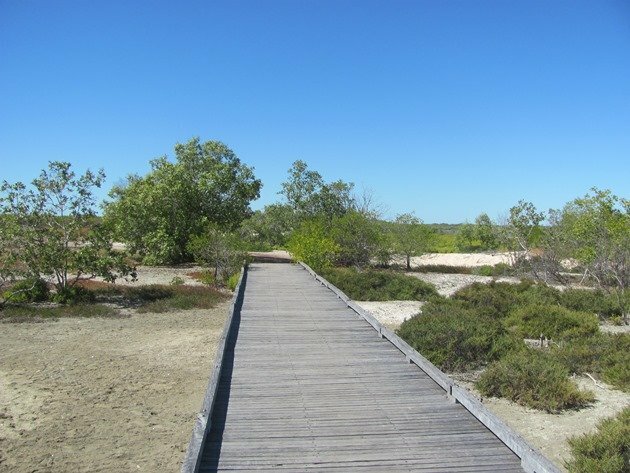 Once you reach the coast you are then able to walk all the way to the other half of Karumba on the walkway, which hugs the coast and the proximity of the water varies by the tide. Silver Gulls, Crested Terns, Caspian Terns, Gull-billed Terns, Pelicans and a White-bellied Sea-Eagle were observed in this area. 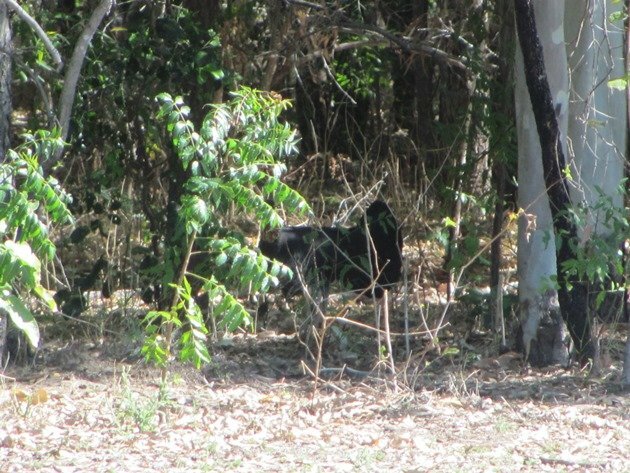 We had our lunch in Karumba by the Norman River where we observed White-gaped Honeyeaters, Sacred Kingfisher, Spotted Bowerbird, Blue-faced Honeyeaters, Yellow Oriole, White-bellied Cuckoo-shrike, Apostlebirds and Pied Butcherbird. 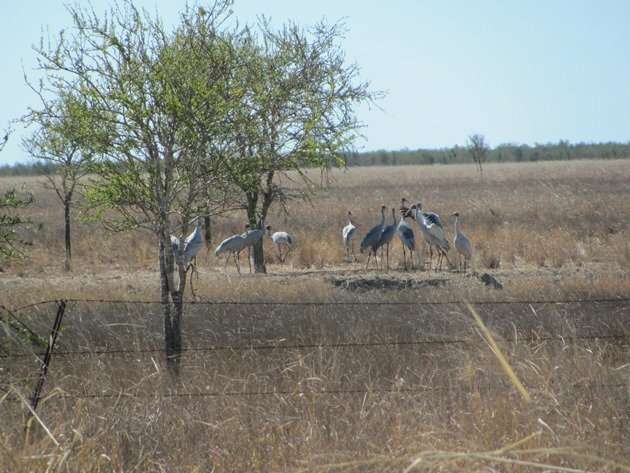 We then headed for the area close to the golf course and sports fields that looked promising for birds and our last chance to get phone and internet coverage before we headed out of town. There was an area that was damp on the edge of one of the sports fields and Double-barred Finch were dropping down to drink. 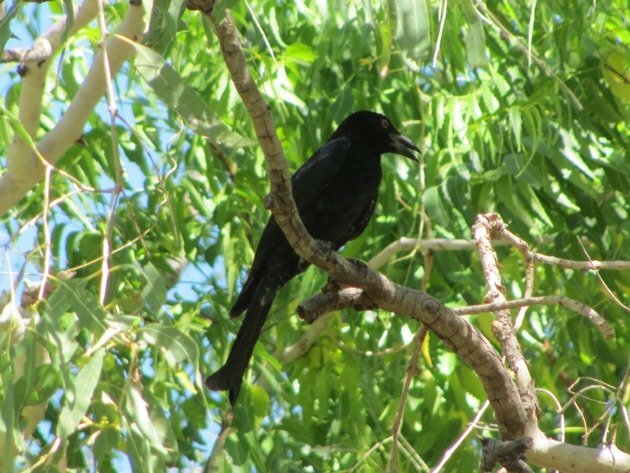 They were soon joined by Bar-shouldered Doves and Silver-crowned Friarbirds and Red-tailed Black Cockatoos were roosting in the tall trees. We decided to have a walk around the edge of the sports field and a strange large shape suddenly attracted my attention. An Australian Brush Turkey was busy kicking through the fallen leaves and its huge black body and tail was all that I could capture! 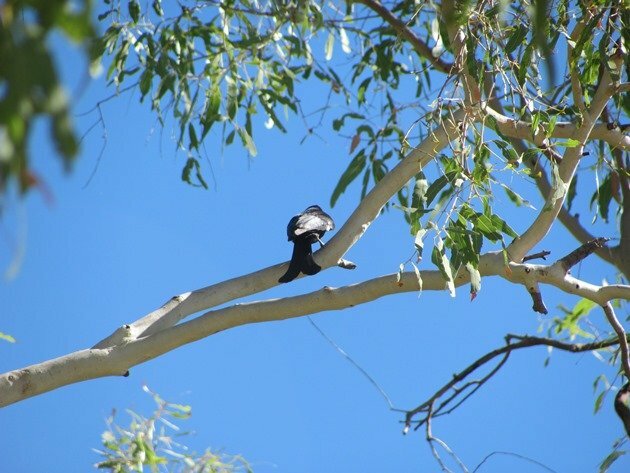 Shortly afterwards we were looking upwards at a pair of Spangled Drongo with their magnificent tails and the trees were filled with the sound of Australian Yellow White-eyes. A Little Bronze Cuckoo called from the mango trees and we had found a great area to bird around the sports fields. Birding around Karumba was very rewarding and there were several raptors near town including Black Kite, Brown Falcon, Black Falcon, Nankeen Kestrel and Whistling Kites. 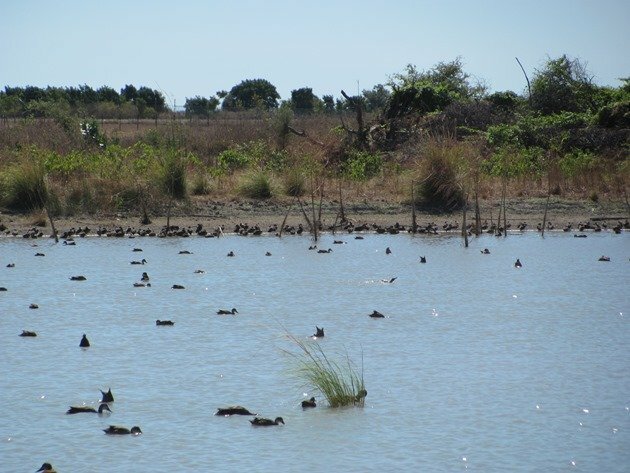 We had observed over fifty species of birds close to the township of Karumba and later in the year the number would be greatly increased with the return of the migratory shorebirds from the northern hemisphere. Getting to Karumba could become problematic during the wet Season, though with flooding making some roads impassable. As always, loving the descriptions of birding in Australia! Thanks, Pat. There’s always a lot of variety! In the immortal word’s of Rod Steward: some girls got all the luck!